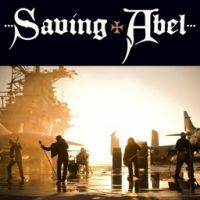 As I so discreetly hinted above, Saving Abel could have been just about any other band out there. There is very little to distinguish them from said bands (and numerous others), and while tracks like ‘New Tattoo’, ‘Addicted’, ‘In God’s Eyes’ and ‘Beautiful You’ are pretty neat rockers that I’d happily tap my foot to any day while speeding down the highway with an open window, I would be hard put to actually name the band or, indeed, any one of their songs if I heard them on the radio. Ironically, that’s more or less how lead singer Jared Weeks describes their music: “The first time someone hears us, they go, ‘I know that band!’ Then someone explains, ‘no, it’s a brand new song and band.’ Saving Abel has an accessible and comfortable sound – you HAVE heard us before!” Well, bravo, I guess. If their ambition is to sound like everyone and no one in particular and thus come across as bland, uninspired and harmless, they’ve succeeded in full. For reasons inexplicable, however, I find myself actually harboring a certain sympathy for this band and their completely banal album except for a couple of horrible pop ballads such as ‘Beautiful Day’ and ’18 Days’ which I really do abhor. The production and execution of the songs are flawless (what else might one expect from Virgin who probably also ‘lent’ a helping hand in writing the material), and most tracks have a pleasantly rough edge to them. So to sum up: An album that I wouldn’t mind listening to on occasion, but I’ll probably forget owning it within the next few days. Likeable, yet forgettable.